DC has brought an interesting list of excitement to the year of 2016. For this is the year that it made inertia with its new ‘official’ cinematic sandbox: The DC Extended Universe. What with DCEU having a three year holiday from having to deal with Man of Steel’s ambiguity, it is now back hard at work with the added promise of releasing two films a year. Meanwhile DC Universe is having a rebirth so that their older… more devoted fans … (Hi there!) … can have a taste of the old continuity they had come to love before the time-twister buzzword-driven reboot i.e. The New 52 in 2011. However with all this happening, the big thing that seems the most important to discuss for DC’s 2016 is the next in the DC Animated Movie series: Batman: The Killing Joke. 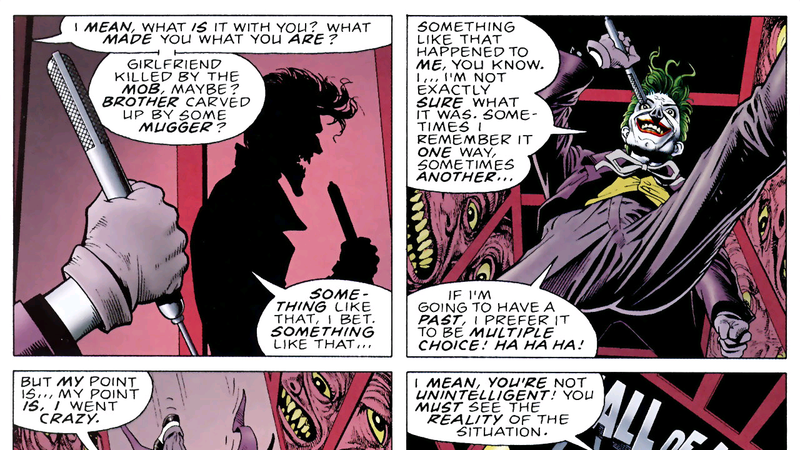 Based on writing-legend, Alan Moore’s 80s mini-series, it’s fundamentally a story based on the Joker’s insanity and his ideology to the fragility of the stable mind when it comes to having one bad day and its consequences. This idea he uses to torment Commissioner Gordon. Now DC has brought a sneak peak of the straight-to-DVD film including interviews, animation and clips from the film as well as a look at the voice actors, including the quintessential Batman voice from Kevin Conroy and the quintessential Joker voice from Mark Hamill. This is a hugely popular Batman story and to see it as an animated movie does seem like a worthwhile treat. I think what makes this story so brilliant in its nature, is that it looks at the Joker and Batman having the same origin story at an elementary degree; both characters are shown to have had one bad day that leads to them having the identity that they use. Yet at the same time, both are different in that they have created the opposite result from what their bad days motivated them towards. Its a brilliant design for both characters and give structure to Batman and Joker been one of the most iconic arch-enemies in modern mythology. Well, saying that, as the Joker explains in the comics penultimate scene “Sometimes I remember it one way, sometimes another … If I’m going to have a past, I prefer it to be multiple choice!” Lovely ‘twist’. The Killing Joke is also a top favourite for Mark Hamill. The star said that he was to retire from the Joker after the character’s death in video game “Batman: Arkham City” stating that he would only return to vocalising the Clown Prince of Crime for a Killing Joke animated film. After fans used Facebook as a petition to make the film as well as have Hamill star as the Joker in 2011, the progression towards the film becoming the real deal have been ongoing since. “Batman: The Killing Joke” is expected to be in stores summer this year. Previous Previous post: Review: Batman v Superman: Dawn of Justice. mccomicscaption Create a free website or blog at WordPress.com.